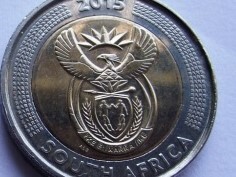 What is your opinion regarding the "Pregnant" and "Tagged ear" Springbok coins? Are these coins really "varieties"? Why not "mint error" or "planchet" errors. The "pregnant" Springbok may either be "mint error" or "planchet error" ( same die - unknown examples ) and not "variety"? Maybe i'm an ID-10-T ... No knowlege without questions. I see them as errors. I always thought coin shifts a fraction during the striking process. But then again if this was the case the we would see these errors regularly in other years, but only see pregnant springboks in 1967 so I'm not so sure anymore. Perhaps it's the die that was worn out on those specific points. Another classic example of this is the 2015 Griqua R5 that has a series of coins struck with no detail on the protea. For those that do not know, there is in fact a King protea flower on the South African coat of arms on which the vulture sits. Many assume it's a diamond, but this is not correct, it's a protea. See below examples of a Griqua R5 with complete protea below the Vulture, second photo of the top of the flower detail that is gone, and the third photo of the detail on the whole flower that is absent from the coin. These are photos of all uncirculated coins so this is not wearing of the high points, but rather a worn die. Secretary bird to be more specific and not vulture. Perhaps it's the die that was worn out on those specific points. Robert, i'm not an expert and i'm not trying to start an argument. This is a photo of the coin that i bought. Maybe the picture was taken by the dealer ... then my appology for using it on the forum. I would think that if the die was worn out, the edges would be more "roundly" formed? With this picture it seems that the edge is more prominent and clear. That is why i said i might consider the "tagged" as a variety. This might have been a different die. In his “History of the Nickel Coins of South Africa” (second edition published in 2013), Professor Francois Malan gives an excellent description and shares some insights on “The Famous Varieties” regarding the R1 coins of the 1960’s. For those of you have a copy of this excellent book, see pages 180 to 183 (it includes close-up pictures of the varieties). For those of you who do not have a copy – shame on you! Hern catalogs the "tagged" ear variety at R400, but when I listed two last year, they sold for less than that. As a matter of interest, I see that he catalogs the 1965 Afrikaans R1 in EF at R6 000 and R4 000 in VF. I would expect the coin to sell for considerably more, although a specimen in VF condition would be very hard to find. I don't think I have ever seen a silver R1 in less than EF condition. How much are recent sales? I ask because I don't believe collectors in your country will pay a high price for this coin in circulated grades since this is true outside of a very low number out of thousands in the broader South African series. My recollection is that 20 to 50 were minted, but I don't have my Hern guide with me, as it is in storage. 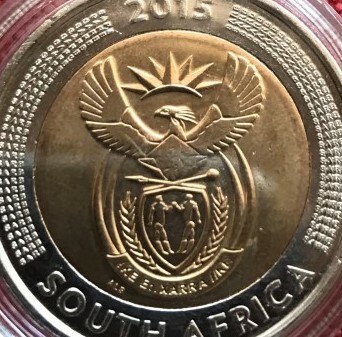 In any event, I can't think of a single coin from the entire South African series which is more overpriced and over rated than these lower mintage RSA coins with the alternate legend. None of them have any distinction outside of the low mintage. My recollection is that more than a few have higher list prices than many of the KGV proofs even though the latter are almost certainly almost always scarcer, more distinctive and presumably preferred by South African collectors. The 1938 proof set has a recorded mintage of 44 and my recollection is that many singles have sold on Heritage for less also. The tagged ear variety was explained in detail on the forum before, explaining the shifting die phenomenon during the minting process. I can remember them selling for R1200 or more at one stage. They should be seen as normal error coins that belong in a popular collecting category. I find the 1965 Afrikaans R1 and 1c difficult to buy at a discount. Compared to the Mandela fad, where the positive political climate at the time played a major role in popularising the collectibility of the coin amongst ordinary South Africans, the 1965 alternative coins, especially the 1c and R1 issues, are soft introductions to numismatic scarcities for budding coin collectors and especially numismatists. If anybody offers me an EF 1965 R1 A for R6000, which will never happen, I would buy it. These and other coins might not make economic sense, but it's part of what makes coin collectors become passionate about the hobby. In any event, I can't think of a single coin from the entire South African series which is more overpriced and over rated than these lower mintage RSA coins with the alternate legend. he can then set or drive up the market price when he sells. With such a low mintage, it's not hard at all. Your claim presumes that others actually want this coin at equivalent or higher prices versus the amount the prior buyer paid which isn't correct. Whoever may be cornering the supply will be stuck with it and only be able to sell at a (substantial) loss. IF someone is actually trying to corner the supply for financial reasons (as opposed to just liking the con), they are engaging in a fool's errand, particularly for a coin as undistinguished as this one which is one of the most over rated coins in the entire South African series. As I explained above and in prior posts on this forum, the only thing this coin (and all RSA with the scarcer legend) has going for it is its narrow and contrived scarcity, that's it and nothing more. Now granted, I will admit to you that my experience on this forum indicates that at minimum, a low proportion of the collectors in your country believe that every scarce or rare South African coin should sell for "moon money" regardless of the merits, but that doesn't mean anyone else will agree by paying the same or a higher inflated price. As I explained before, the most likely explanation for the inflated perception is the list price in Hern and prior South Africa coin price guides. I know for a fact that outside of these coins, more recent low minateg commemoratives and patterns, there are no higher budget buyers of RSA numismatic (as opposed to gold bullion type) coins since the rest of the series sells for nominal prices. Even by the standards of South African collecting which is financially immaterial anyway, the financial scale in RSA is irrelevant. Discount to the Hern Guide catalog price? Or some other price? If the Hern Guide, it's probably because most collectors in your country don't have a clue that the Hern prices are just made up, literally. The coins don't sell very often but even if an owner knows the catalog price is inflated, they don't want to sell it "cheap". If I owned the 1965 Afrikaans 1R in EF, I'd immediately sell it to you at R6000 and use the proceeds to buy much better coins in the same price range which from South Africa would be the scarcer Union such as KGV circulation strikes and the lower mintage proofs. I know for a fact that outside of these coins, more recent low minateg commemoratives and patterns, there are no higher budget buyers of RSA numismatic (as opposed to gold bullion type) coins since the rest of the series sells for nominal prices. Even by the standards of South African collecting which is financially immaterial anyway, the financial scale in RSA is irrelevant. As for the demand of this coin, it is obvious. If there were no demand for it, it would never peak in auctions for R28 000, for that means there were bidders, placing at R26 - 27 - 28 000. They lost out in the end when the auction closed and sold for the winning price. The same holds true for the coins that sold for R8000 & R15 000 respectively as well. These auctions aren't listed at peak price, they get there through bidding. Regardless if you feel this coin is overpriced, the facts are the market dictates price, and there are willing buyers. Now there's no guarantee that if anybody buys this coin at peak price, they'd be able to get their money back someday, but as for person I'm making referrence to who has stacked a collection of these coins, they hold the cards, and set the price. If I step into this guy's shoes, and I purchased these coins at an increasing scale from the first coin I bought to the last coin, where I have now created artificial demand by keeping other bidders from getting these coins on open auctions. The fact that my last coin might sell for 10% below what I payed for is irrelevant as the first lot of coins I purchased for R6000 - 8000 have already sold for an inflated price due to the market misconception that these coins sell for R28 000 hyperthetically. I am aware of this dynamic. What I am attempting to describe to you is a common sense inference, not "fact" and I am not trying to argue with you. No one can "corner the market" and set the price. This is true of any coin. Someone can certainly buy up the supply but invariably, they are the only one who will want it at the inflated prices they paid. Coins aren't like other goods and services which someone buys for utility. Nobody needs any coin. It's one thing to corner a commodity (which if it happens, would be on the "paper" market anyway not physical supply) but another entirely for a collectible trinket with no utility whatsoever. Why? Because there is no market depth for your coinage. The liquidity varies with the coin but it should be apparent it is very few where it can be considered noticeable and where there are more than a minimal number of buyers competing simultaneously or in short proximity. There is hardly any liquidity for most ZAR, much less for coins such as these. It could take years to liquidate even a small position at a profit which make "cornering the market" pointless.